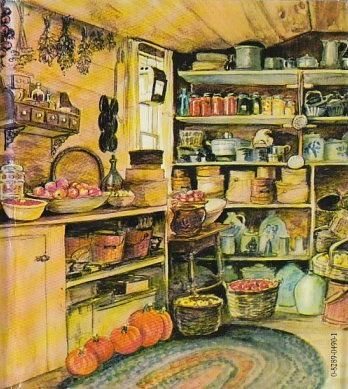 When we think of pantries, we mostly think of food. However, another important function of the pantry in history has been medicinal. 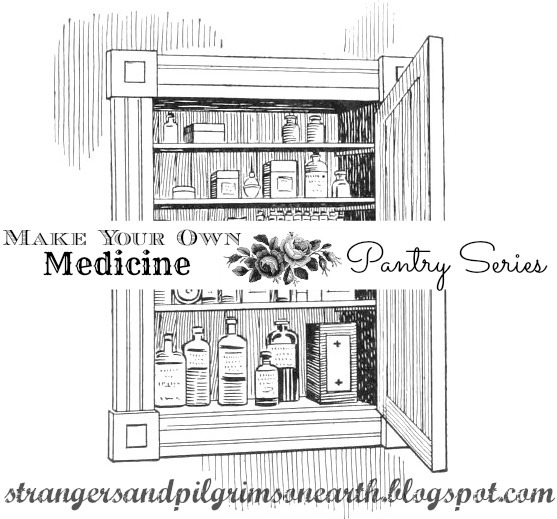 A well stocked pantry can provide the means to make your own simple remedies. She walks carefully from the back door with the basket of damp clothing in tow. She looks forward to these moments of reflection. 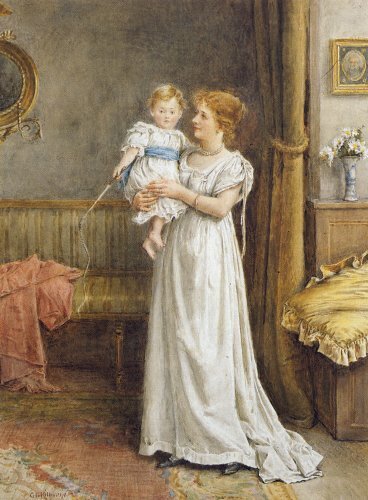 She will skillfully attach the family garments to the clothesline. She will set each pin in place with satisfaction. She takes a deep breathe and inhales the clean wash as it swishes in the spring breeze. Birds are chirping melodies, serenading her. The sun shines upon her skin, embracing her with its warmth. These are her minutes to soak in the beauty of the morning. These are her minutes to ponder and prepare. 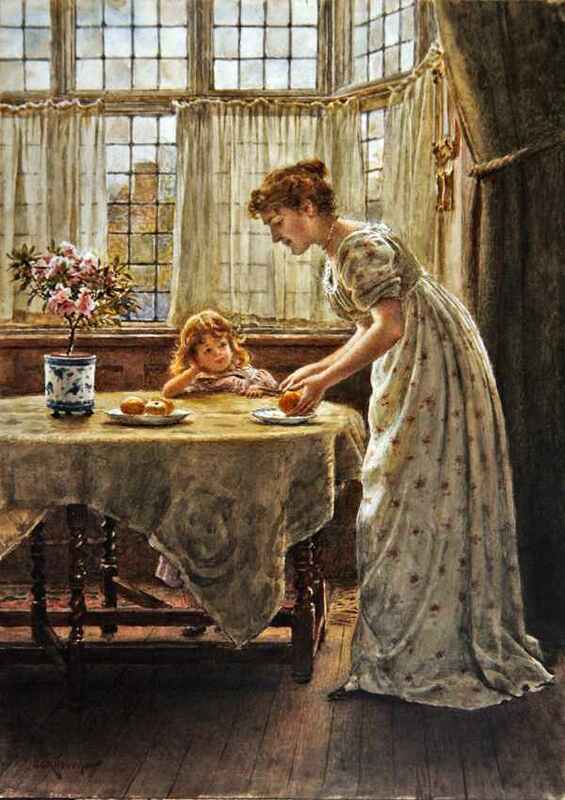 When she does her duties in this thoughtful way, she is more sensitive to the blessings that abound each day. "Give her of the fruit of her hands…"
Variety is said to be the spice of life but I think spices make the variety... A well maintained spice collection can turn you into a culinary queen. 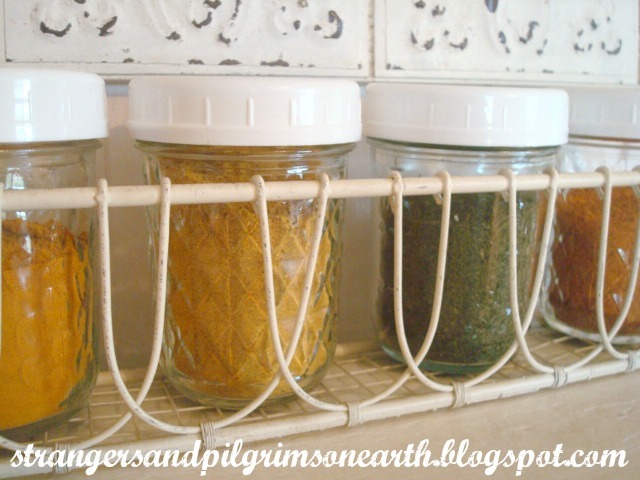 The secret is to actually use them :) They are truly more affordable when boughten in bulk, can be easily placed in recycled spice containers or jars and may be stored in a myriad of ways. 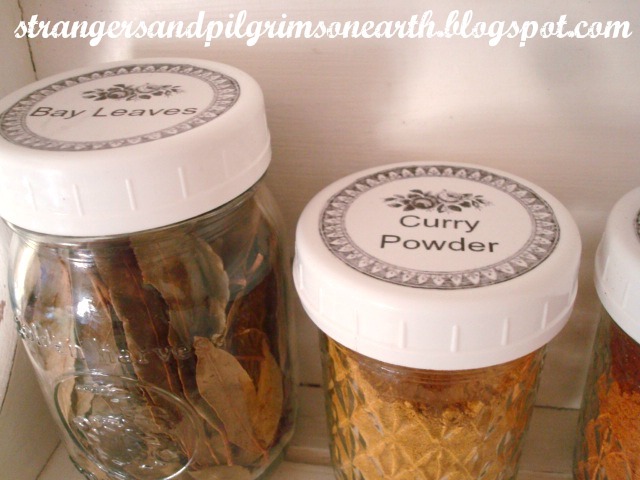 Finish them off with some attractive labels and you are really cooking! I personally like using mason jars with the plastic caps because they are easier to measure from. 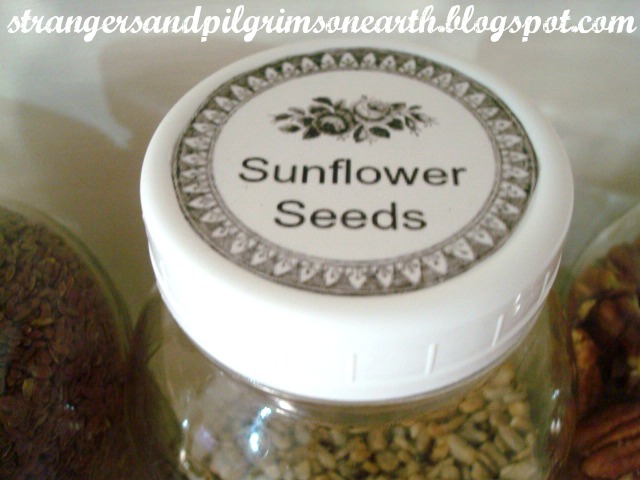 You can place the labels on the lids or you may glue them to the front of your jars. 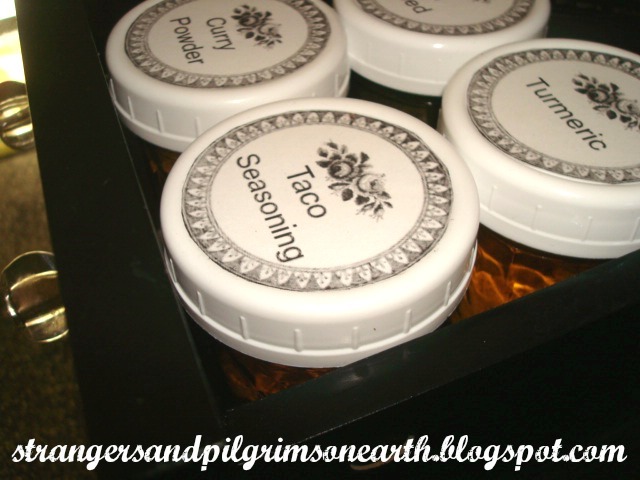 The idea is to keep the labels at eye level so that your spices and seasonings are quickly found. These labels can also be affixed to plastic storage containers with a glue stick. 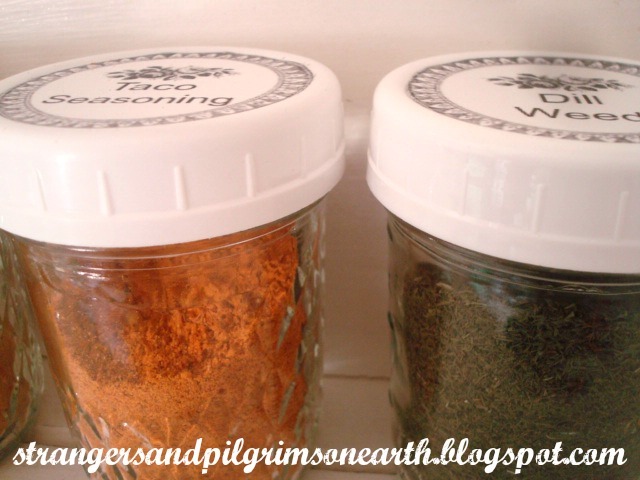 For instance, if you purchase seasoning packets in bulk and store them in Tupperware, then label your Tupperware. Be creative with what you have! Some place their spices inside of a drawer. With a label on the lid, you can view your inventory at a glance. 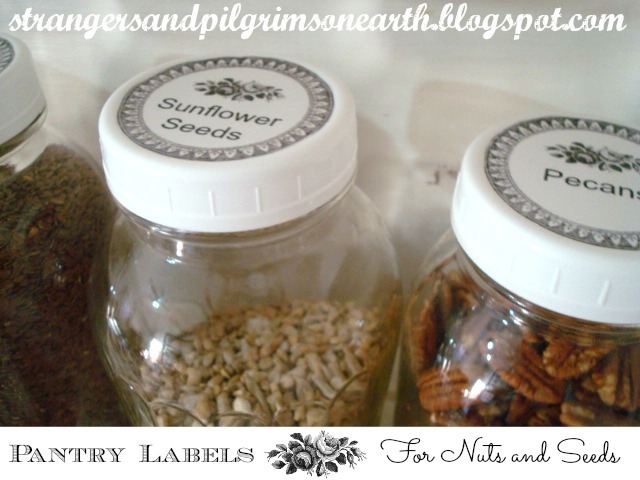 The wonderful part about pantry labels is that they bring everything together in a matching collection no matter how differently they are stored. Some of our food is in plastic containers, mason jars, recycled condiment jars while some are in Fido jars. However, it still looks nice and neat because of the unifying labels. 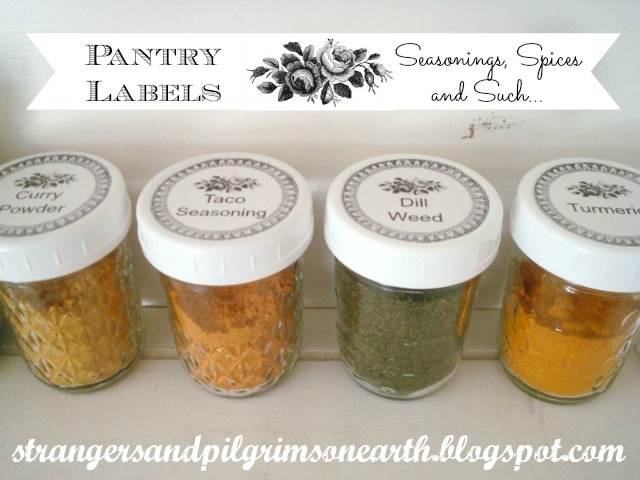 For a set of our pantry labels featuring "Seasonings, Spices and Such", simply download and/or print from this link HERE. You can either print them out on plain paper, cut to size and affix to your containers with glue (or decoupage) or print them out on sticker paper and cut to size. If you choose the first route, you may want to place a piece of packing tape or clear contact paper over each label to protect them. 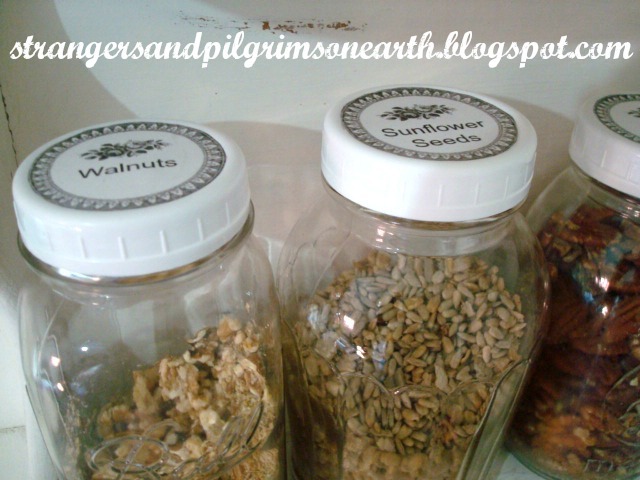 You may also be interested in our "Basic Pantry Labels" and our set for "Nuts and Seeds". For further fun, visit our Make Your Own Seasoning Mixes with Printable DIY Recipe Kit which features recipes, printable labels and directions for our favorite 6 seasoning mixes. This post may be shared with some or all of the following link-ups: The Art of Home-Making Mondays, Modest Mom Monday's, Monday's Musings, Make Your Home Sing Monday, Good Morning Mondays, The Scoop, Titus 2sdays, Titus 2 Tuesdays, Roses of Inspiration, Tuesdays with a Twist, Raising Homemakers, Wise Woman Link Up, Homestead Blog Hop, Wow Us Wednesdays, Coffee and Conversation, Homemaking Thursdays, Home Sweet Home, Our Simple Homestead, From the Farm Blog Hop, Front Porch Friday Blog Hop, Awesome Life Friday Link Up, Five Star Frou Frou Friday, Simply Natural Saturdays and Clever Chicks Blog Hop. Thank you lovely ladies for hosting these. Graphics for this project are courtesy of *The Graphics Fairy*. 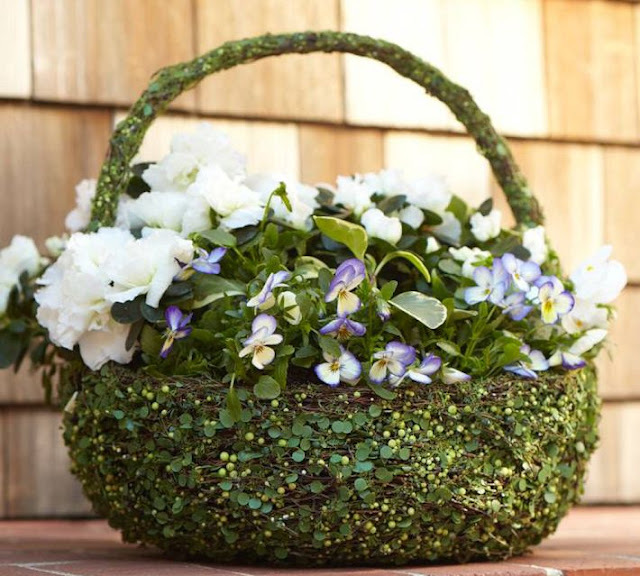 Here are some spring decorating ideas from an expensive retail store (aka Pottery Barn) that you can produce for *free* in your home. A pleasant nature walk with your family will provide the resources for many of these peaceful settings. 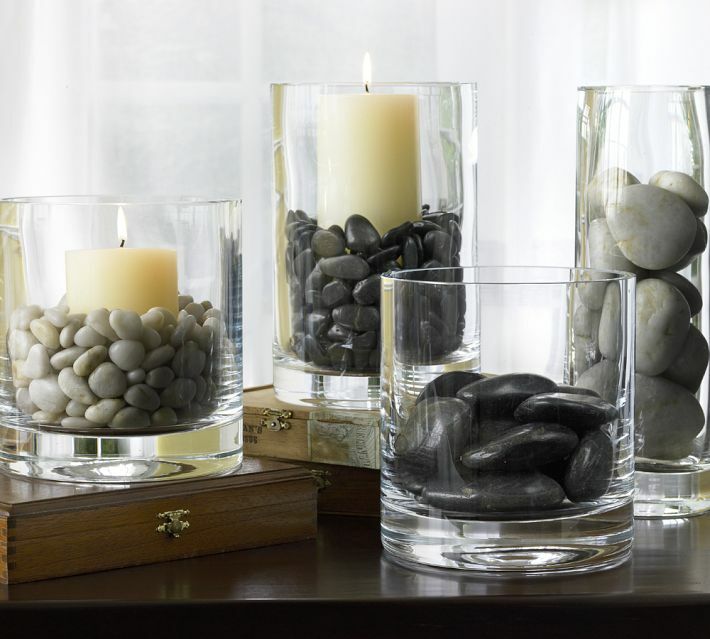 Some collected pebbles and rocks could be dropped into an antique jar or glass vessel. 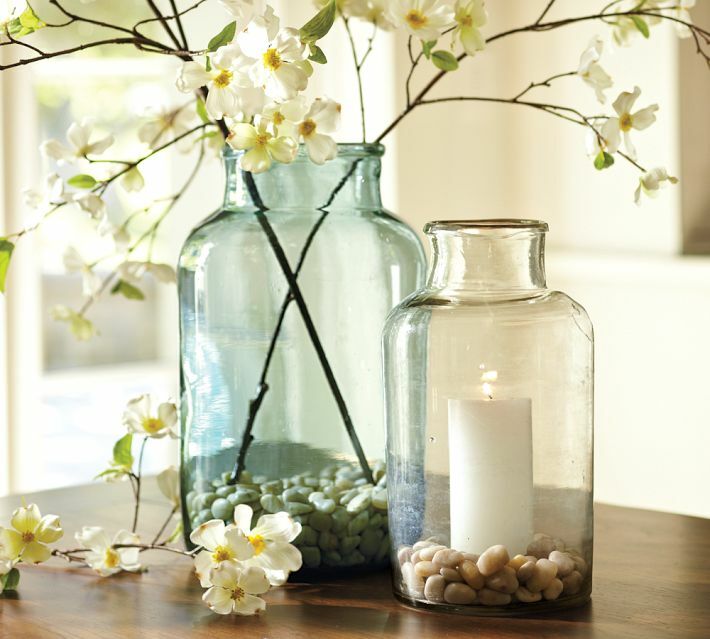 Add a candle or a few dried flower stems (my choice would be roses, what about you?) for this simple vignette. Forage for larger, smooth stones of the same colors to create this serene ensemble. 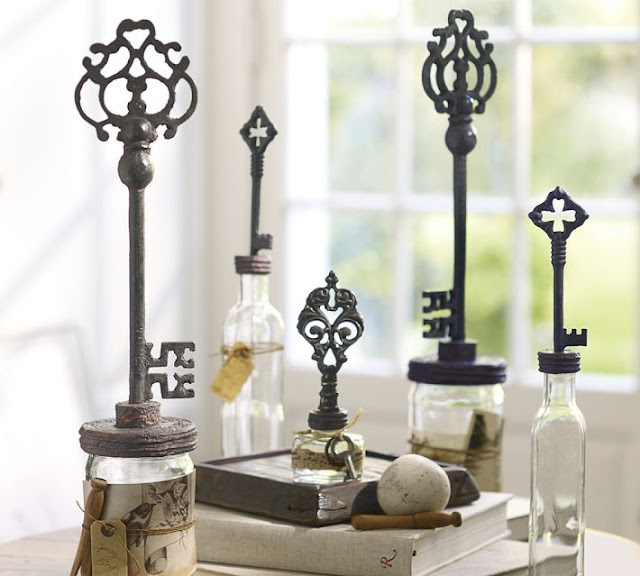 A mason jar would be attractive for this project as well. For a romantic look, add a strip of ribbon or lace (or replace the rocks with an assortment of beads and pearls). Place any vintage volumes and "artifacts" in a tray to provide a nostalgic look. Though the toppers may be hard to reciprocate, the decorative jar certainly isn't. Some antique clip art, attached with a vintage style tag, twine and trinket gives your home a tranquil, naturalist ambiance. and lay up corn under the hand of Pharaoh, and let them keep food in the cities. which shall be in the land of Egypt; that the land perish not through the famine." yet they prepare their meat in the summer…"
and gathereth her food in the harvest." “It is not often that a man can make opportunities for himself. 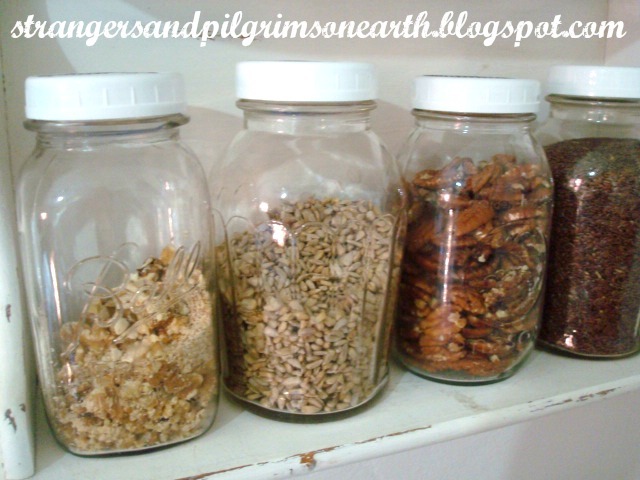 Should a Christian Practice Food Storage? 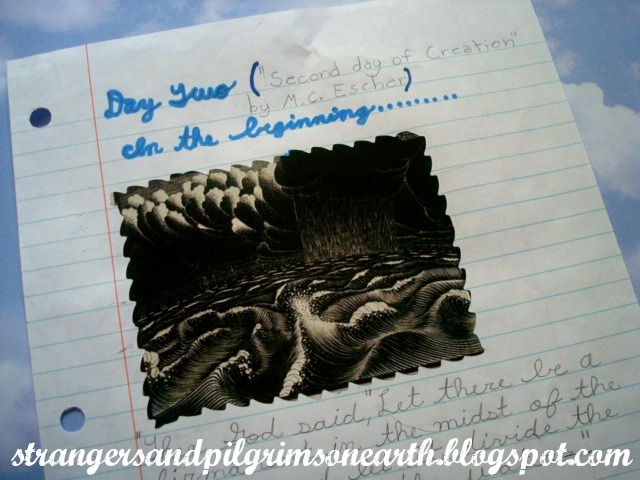 Today we are sharing samples from our simple studies of the History of the World, starting with creation. 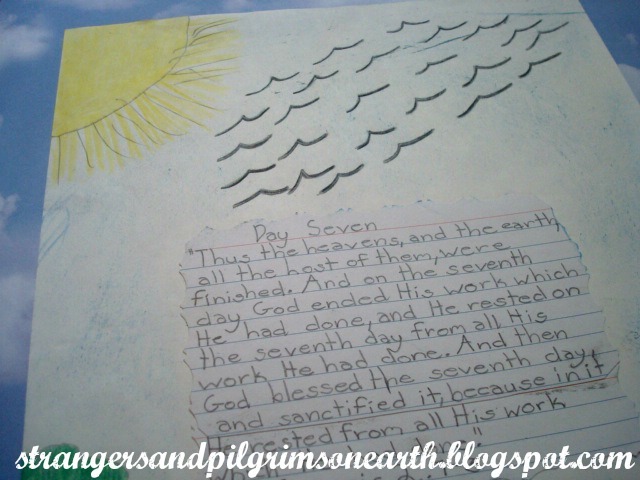 We have done a lot of creation related activities in our homeschool so this particular study wasn't in depth. It was more of a review for us but I would like to share our journey in case any one is intimidated to try something like this. The school subjects taught in this unit are shared in parenthesis. For our "Book of the Centuries Timeline", we recorded each of the seven days as a separate page entry since this was a special week. We printed out the appropriate Scripture and illustrated it for our timeline. 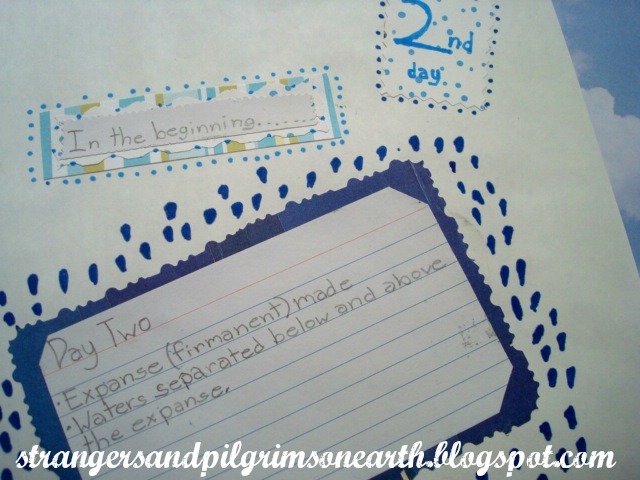 Day one and day seven are shared above (Subjects accomplished include: Bible, world history, language arts via copywork, science/nature, art/crafts). 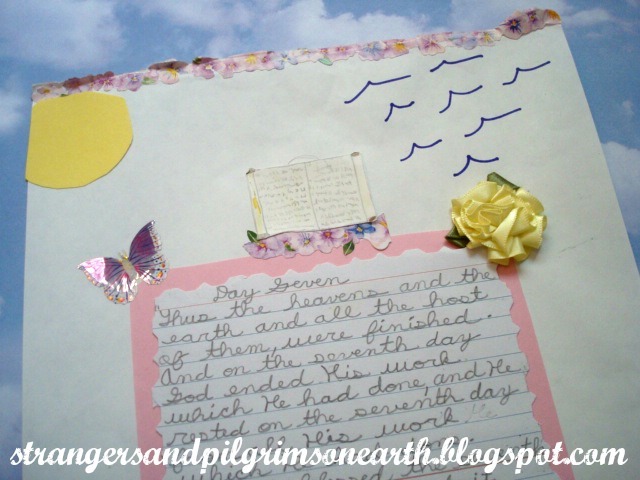 We recopied the creation day Bible verse that we used in the timeline binder but in handwriting this time (Bible, cursive, language arts via copywork). We did a scrapbook style page showcasing each creation day. 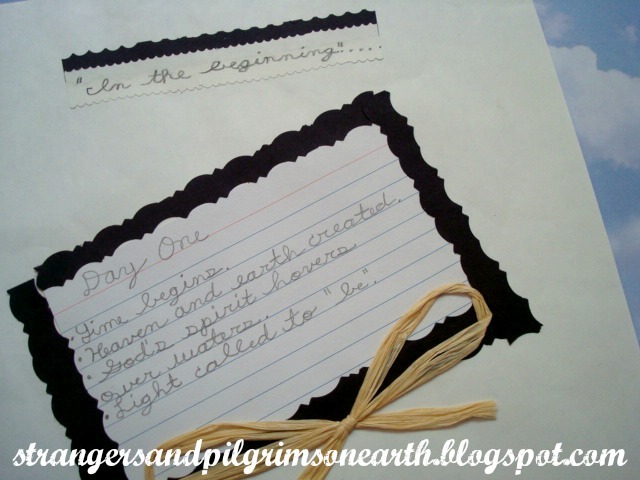 Our first entry was simply a half white/half black construction paper page (arts/crafts) symbolizing the light and darkness. Each day, we read a few pages from The Amazing Story of Creation by Duane T. Gish, Ph.D. in order to learn about the science of creation and the evolution debate (science/nature, Bible). This book reinforces the truth of the Scriptures using observable science. If you are struggling in an area in the word of God that you think contradicts science, you will find answers here in this "Supposed Bible Contradictions Index". 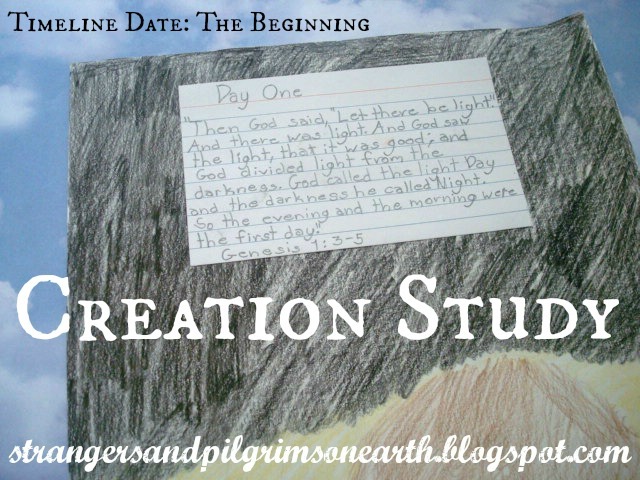 Next, we recorded what was specifically created on each day (science/nature, arts/crafts) and read related picture books or encyclopedia entries on the subjects (such as "light"). We used the first few chapters of "Unlocking the Mysteries of Creation" as a resource for this section. This book is very detailed and would be a help to someone who has questions and doubts about evolution versus creation but it is a little advanced to be read in its entirety to elementary aged students. 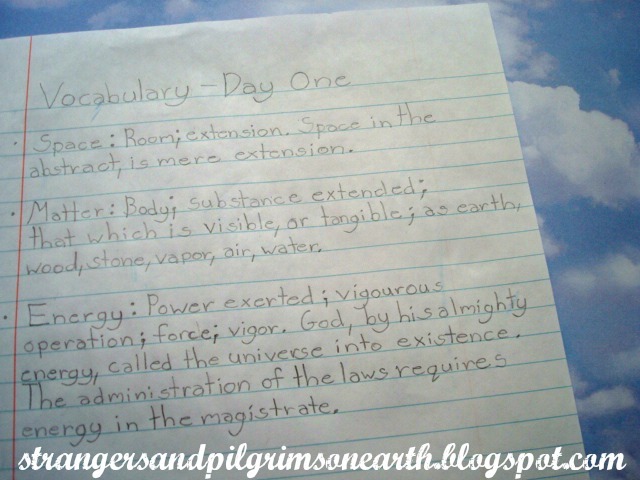 We used the Webster's 1828 Dictionary and defined key words for each creation day (language arts, science/nature). We tried to accompany each creation day with artwork for picture study (fine arts). 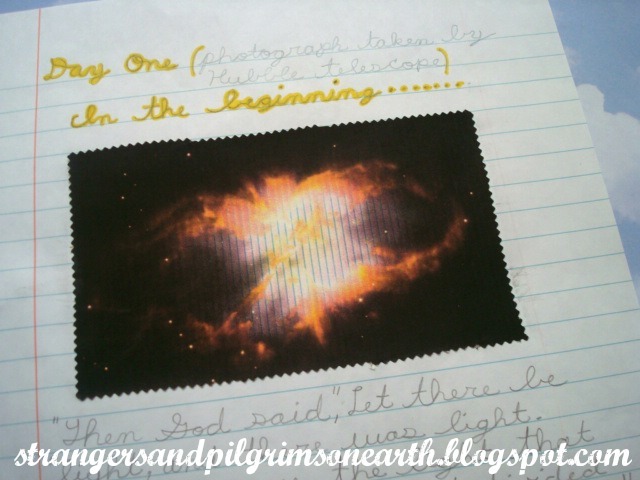 For day one, we used a photograph that the Hubble telescope took. 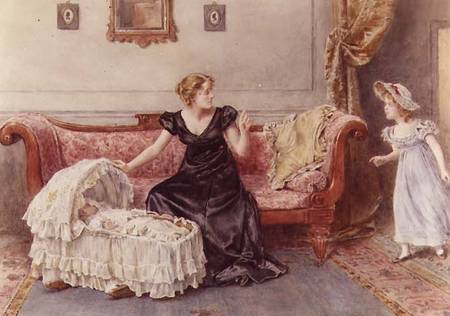 Older children can write an art review below the picture (language arts) while the younger children can explain their feelings about the art (narration). We continue to document what was created on each day and read accompanying books on the subjects (arts/crafts, science/nature). 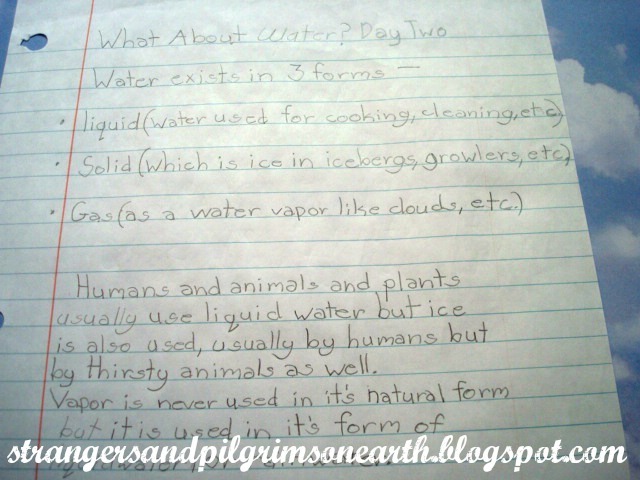 We went into detail about water and how it exists in three forms (liquid, solid, gas) and shared examples of this. 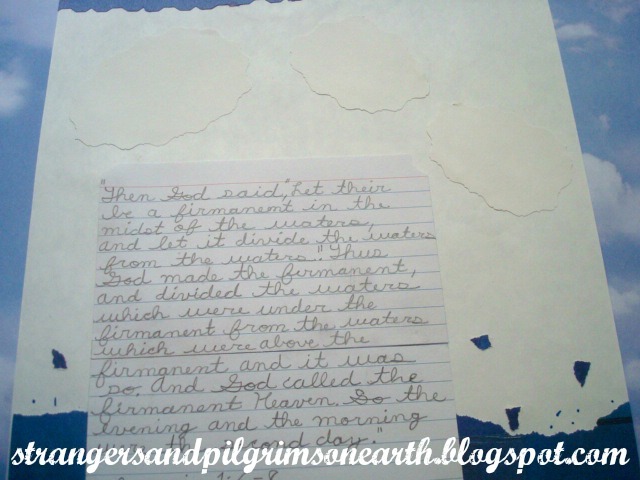 When we got to day six, the verse was quite long so we used Microsoft word (Bible, typing) and printed it out for our scrapbook page (arts/crafts). At the end of this study, we wrote a poem about creation (language arts). On the weekends, we watched educational (but fun) movies about creation (shared below). 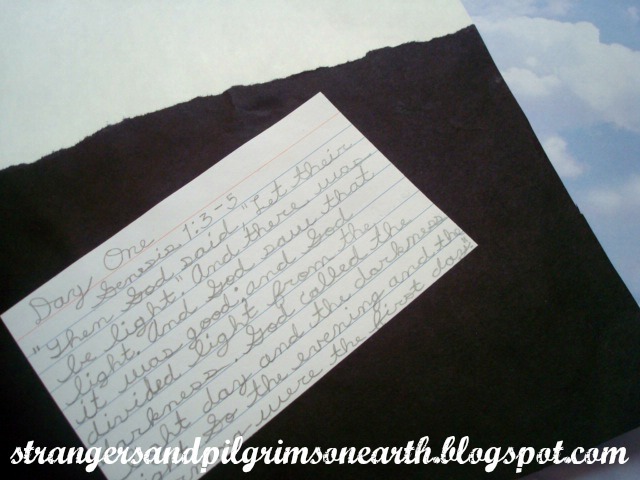 On day seven, we scrap-booked and copied the appropriate verse (arts/craft, cursive). We also took this opportunity to discuss the importance of the Sabbath (Bible). During this study, as the clothes needed folding and housework needed doing, we listened to Jonathan Park "Creation Science" Adventure Series on CD (Bible, science/nature, character building, home economics). These CD's alone could teach creation without any effort from mother. We followed this "Creation Study" with a study on Dinosaurs. You could also blend the two together since dinosaurs were created on day six. You can find free creation books online from Answers in Genesis here. 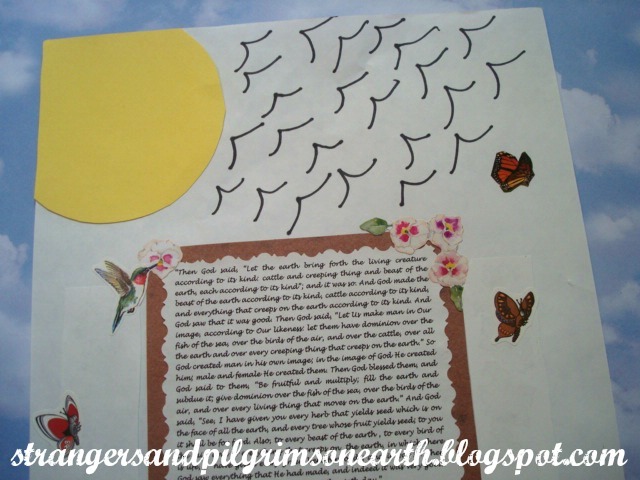 They also offer some teacher's resources on creation and a "Terms to Know List" that may be helpful. They share bookplates that you can print out for your students. If you live near Kentucky, you can visit their Creation Museum. Should you have any questions about science being in harmony with the Scriptures, you will find answers here. "If God’s Word be true, evolution is a lie. I will not mince the matter: this is not the time for soft speaking." The latest, choicest part of heaven’s great plan. Helpmeet is found for laboring, suffering man. Her moulding power, her radiant virtues shine! Our first foods in the Garden of Eden certainly deserve their own spot in the limelight. 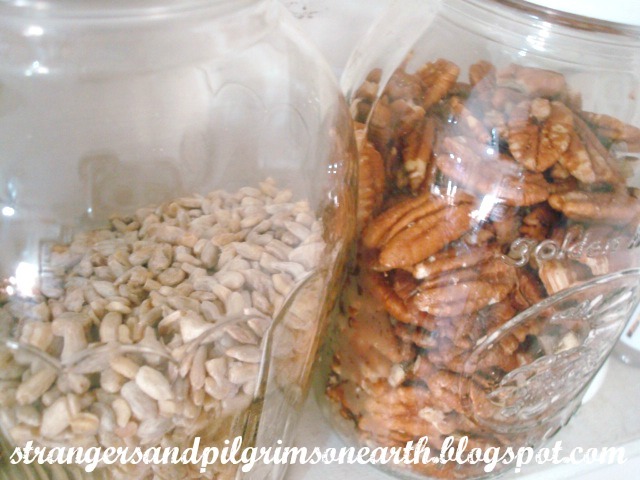 We store the majority of our nuts and seeds in the freezer (to keep them from going rancid), however, a smaller amount can safely be kept in airtight containers for quick snacks and such. 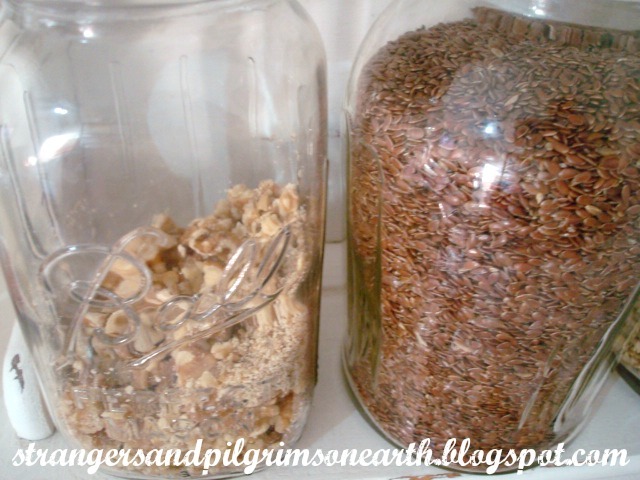 We went "round" on these labels because we store them in jars. However, they can still be used in the traditional way (affixed to the front). We continued the floral theme in order to coordinate them with our basic pantry labels. I am rather addicted to the plastic caps. 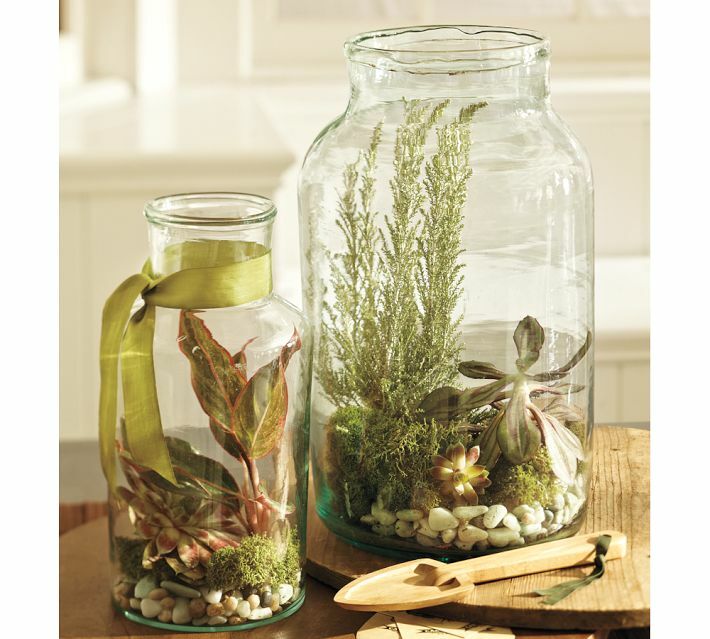 They turn every canning jar into a convenient storage container. 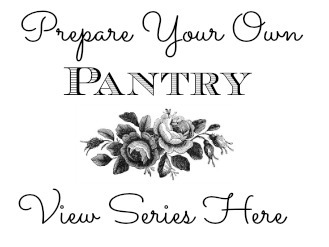 Would you like to label a set for your pantry? Simply download and/or print for FREE from the link HERE. You can either print them out on plain paper, cut to size and affix to your containers with glue (or decoupage) or print them out on sticker paper and cut to size. If you choose the first route, you may want to place a piece of packing tape or clear contact paper over each label to protect them. 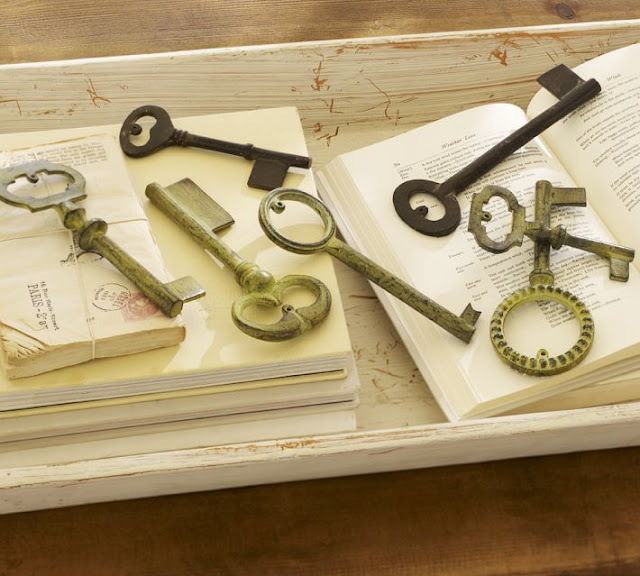 These simple, organizational projects are a fun way to sprinkle love into ordinary spaces. They help to turn a humble house, into a home sweet home. 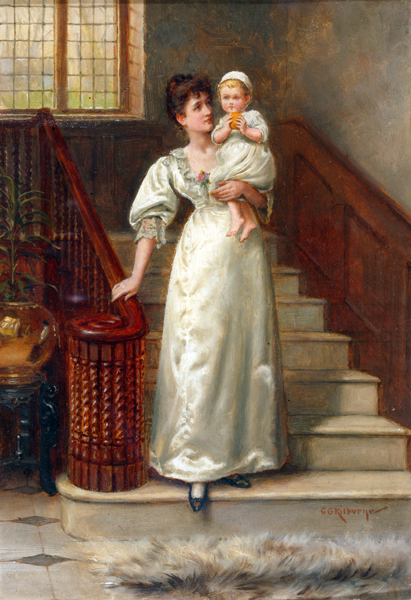 "Her spirit (the wife) gives the home its atmosphere. Her hands fashion its beauty. Her heart makes its love. 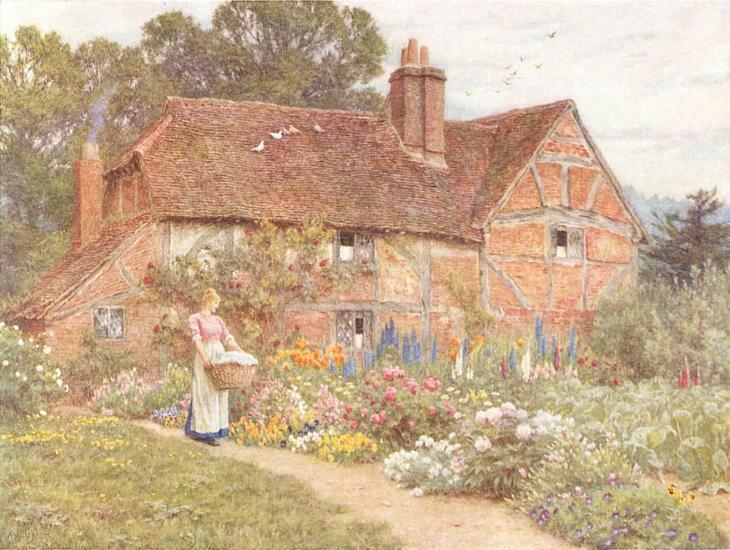 And the end is so worthy, so noble, so divine, that no woman who has been called to be a wife, and has listened to the call, should consider any price too great to pay, to be the light, the joy, the blessing, the inspiration of a home." 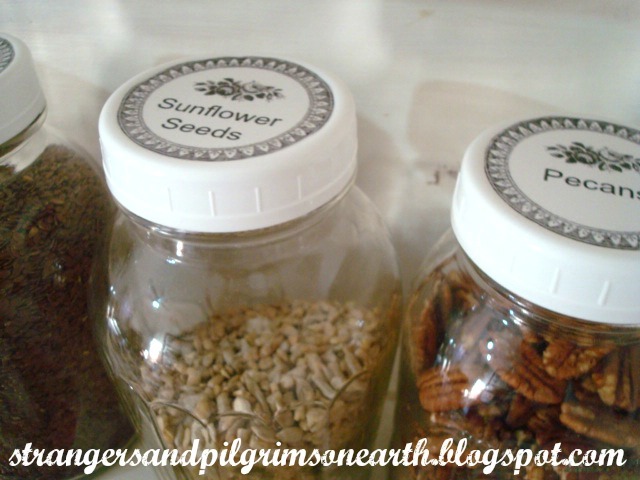 You will find our "Basic Pantry Labels" here and our "Seasonings, Spices and Such" set here. I invite you to subscribe to this blog (located on the sidebar) in order to keep updated on future homemaking printables. This post may be shared with some or all of the following link-ups: The Art of Home-Making Mondays, Modest Mom Monday's, Monday's Musings, Make Your Home Sing Monday, Good Morning Mondays, The Scoop, Titus 2sdays, Titus 2 Tuesdays, Roses of Inspiration, Tuesdays with a Twist, Raising Homemakers, Wise Woman Link Up, Homestead Blog Hop, Wow Us Wednesdays, Coffee and Conversation, Homemaking Thursdays, Home Sweet Home, Our Simple Homestead, From the Farm Blog Hop, Front Porch Friday Blog Hop, Awesome Life Friday Link Up, Five Star Frou Frou Friday, Simply Natural Saturdays and Clever Chicks Blog Hop. Thank you lovely ladies for hosting these. Graphics for this project are courtesy of The Graphics Fairy.